“Stop the Abuse” is a consumer guide for Massachusetts residents and their families to immediately stop ongoing abuse and neglect of elder residents in nursing homes and long term care facilities. Attorney Bernard J. Hamill of the Hamill law firm has published a free guide for Massachusetts residents who have a loved one in a nursing home or an assisted living facility. The nursing home abuse prevention guide, in PDF format and obtainable at the Hamill law firm website, at “Stop the Abuse” was written exclusively for Massachusetts long term care residents and their families, The guide provides numerous resources in one convenient source to help consumers locate help for their loved ones in a time of emergency. This guide provides elder abuse hotline numbers as well as the addresses of important state agencies that are available to prevent and investigate incidents of nursing home abuse and neglect. Advice is given in the guide for several approaches to the problem of bad nursing home care. The guide will instruct how to prevent nursing home abuse; how to address the abuse in house; how to file formal complaints with appropriate watchdog agencies; when to hire a nurse advocate and how to best present and prepare an abuse complaint. Proper handling of suspected neglect at the beginning sets the stage for immediate successful resolution of any complaints. Proper knowledge about how to effectively register an abuse complaint will result in quickly stopping any neglect and guaranteeing adequate care as required by state and federal laws. This free guide was written to help Massachusetts consumers and was written by Massachusetts attorneys with experience handling elder abuse claims. It is based on years of advocating for victims of nursing home abuse. The Hamill Law firm has been representing victims of nursing abuse in Massachusetts for over three decades. Hamill law firm has achieved some of the highest verdicts for “emotional distress” awarded to nursing home victims in Massachusetts. Hamill will advance all the necessary costs required to effectively advocate your case. Choosing the right law firm does make a difference. Over the last five years all of Hamill law clients have been successful in receiving justice for documented neglect and abuse. 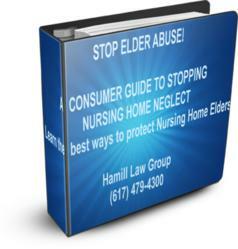 The Hamill Firm encourages the families of all Massachusetts nursing home residents to take advantage of this free guide available only by visiting the firm website by clicking here: Stop the Abuse Guide.